In previous articles, we dealt with the European institutions as such and the way they work and interact in Brussels and Strasbourg. Now we will focus on a particular European issue which has been tabled last autumn and which is discussed among European institutions and stakeholders: The Clean Energy Package published in November 2016, also called ‘Winter Package’ or ‘Winter Package Energy’, whereas the European Commission took the initiative (see article ‘Understanding the EU Institutions’) and presented it according to European institutional procedures, i.e. the European Parliament and the Council will decide on it. At present the “Package” is discussed in various committees of the European Parliament, such as Industry, Research and Energy (ITRE) and Environment, Public Health and Food Safety (ENVI). The Energy Union is one of the ten priorities of the Juncker Commission. In line with the objective of modernising the EU economy, it should help creating jobs and stimulate growth and investment in Europe, along with other initiatives. The energy sector is the driving sector for the European economy. Energy costs have an impact on the competitiveness of the economy as a whole and account for about 6 % of annual expenditure on private households. The energy sector has almost 2.2 million employees in more than 90,000 companies across Europe. The package consists of 6 regulations and 4 directives and is intended to help reach the three main objectives: priority for energy efficiency, achieving a global leadership role in renewable energies and provide a fair deal for consumers. The package includes: a new Energy Efficiency Directive (EED), the revision of the Energy Performance of Buildings Directive (EPBD), the revision of the Eco-design Directive, the Governance Regulation which should lead to better coordination of national energy policies, as well as a new Directive for Renewable Energies and the new European Electricity Market Design. Measures for the achievement of the objectives are an energy efficiency target of 30 % until 2030 made binding across the EU and the increase of investments for renewals in public buildings to push energy efficiency goals. A further important measure is to adjust the electricity price policy to avoid any suffering from energy poverty. Particular attention is set to the renovation and digitisation of buildings. The starting point of the Winter Package is the ‘Efficiency First’ principle, which is applied in the further revision of the EPBD. The increase in energy efficiency is the key element towards an energy union, thus reducing the dependence on energy imports and to combat climate change. 75 % of buildings are energy inefficient and buildings make up around 40 % of primary energy needs. The average renovation rate in Europe is around 1 % per year, whereby Germany and France having the highest rate of almost 2 % per year. The Commission will introduce the ‘Intelligent Financing for Intelligent Buildings’ initiative, to mobilize and give incentives to private finance for energy efficiency measures and a wider use of renewable energy in buildings. At present European Institutions and stakeholders focus on the new EED and the EPBD. A first exchange of views on both directives was held end of March in the ITRE committee. The draft report for the EPBD has been published on 4 May 2017, the rapporteur is MEP Bendt Bendtsen, member of the EPP (European People’s Party) from Denmark. The draft report for the EED is expected to be available soon, the rapporteur is MEP Adam Gierek, member of S & D (Socialists & Democrats) from Poland. After the publication of the EPBD report, stakeholders have been able to suggest modifications to amendments for the report. MEP´s in respective committees will deal with a large number of amendments and try to cluster similar amendments to facilitate the legislative procedure. A debate on the amendments will take place early July and the vote in the ITRE Committee is scheduled for October 2017. Provided that the timetable is respected, the vote in the plenum will take place in November 2017. Another important aspect for the implementation of the EPBD is the digitisation of buildings. The so-called ‘smart buildings’ are designed to make buildings smarter, in which digital tools will be used. ‘Smart buildings’ will provide any user of the buildings the opportunity to control and manage energy consumption autonomously – for such purpose smartness indicators are to be introduced. The concept of the ‘smart buildings’ will certainly enable the construction industry to apply digitalisation to cope with new challenges ahead. The revised EPBD stipulates that from 2025 onwards each 10% of parking spaces require an electric charging station. The Commission also wants to seize the opportunity of increasing the demand for e-mobility. It is therefore debatable whether the installation of charging stations leads to unnecessary costs since it is not clear whether the demand will increase or not. The amendment proposed by MEP, Bendt Bendtsen, provides an alternative to the Commission’s proposal. This takes into account the possibility of pre-cabling for electric charging stations – which then just need to be expanded according to actual demand, hence avoiding excessive costs right now. The revision of the EPBD also includes the introduction of EU-wide energy performance certificates. Buildings are energetically evaluated by the energy performance certificate. Even if the energy building certificate is a step into the right direction, it does not replace energy consulting. In order to achieve high energy efficiency for buildings, inhabitants resp. users of buildings must be furnished with information on the most advantageous use of energy in buildings. The Clean Energy Package is also subject to discussions within the European Council. A first Council meeting took place in February 2017 in the Council for Transport, Telecommunication and Energy (TTE). However, the Council has not yet finalised a position about the Clean Energy Package. At that stage it is up to stakeholders to intervene at local level, i.e. 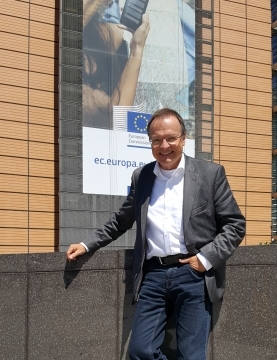 at Ministries at “home” and simultaneously in Brussels at each Permanent Representation Office of member states. This is one of the major tasks and challenges stakeholders face when dealing with European dossiers.